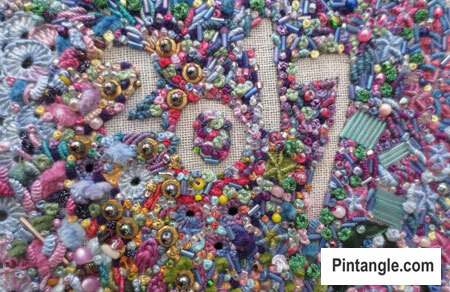 Last month I shared with readers how I had been doing a daily stitch challenge. 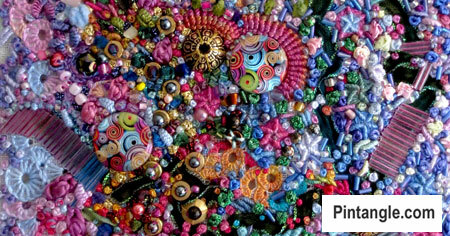 I have been having a ball working a piece that is heavily textured with embroidery and beads. This year these challenges are all over Facebook and as you can see I have been having fun with them. I have shared details about the two I am doing at the end of this article. When I left off last month I had explained how apart from selecting a colour scheme my aim was to commence in freeform manner and respond to the stitching as go designing on the fly. When I do this type of embroidery in order to prevent the project becoming a hodge podge of stitches and visual mess, as some stage in the process I pull out what I call my design tools and using my knowledge of design I respond to what I have just stitched. I compare it to Jazz. This technique is an improvisational process. In last months article I had explained how I started embroidery, then decided it would be the header piece for my sampler this year. New readers to this site may want to check out my nearly 100 ft band sampler which you can read about here. I had two issues to deal with. The wall of stitching needed a bit of visual break and I needed a point of focus. The date, which consists of voided numbers solve both these issues. A third issue was also developing and that was that the viewers eye got stuck on the textured stitches rather than traveling around the piece so I needed to provide a path for people to travel along. For those non-design folks this is not a literal path but the path the eye takes as it looks at the piece. I did not want to turn this into an exercise in composition but I did want to have the viewers eye move around a bit. So this past month has been working on subtle almost subconscious paths in the piece. Down the left side of the piece I worked a number of buttonhole wheels, cast on stitches and french knots. The main thread I used is a hand dyed cotton perle #5 thread. Since the same stitches worked in the same thread are repeated along the edge they form an informal line or boundary to the side of the piece. They are still freeform but at almost a subconscious level the viewer reads a line. On the right side of the piece I used once again I used the design device of repetition. This time the stitches I repeated are whipped wheels French knots, Bullion knots and a scattering of small blue bugle beads. Basically I have been working on these three ‘invisible’ lines that run down the piece. So now its time for the great reveal – this is what I call the header for the year (on my band sampler) ended up looking like. And here for readers enjoyment some eye candy in the form of detail so you can see how closely packed the stitches and beading is. The rest of the time has been spent packing the spaces with stitchery. So far in this piece I have used chain stitch, oyster stitch, buttonhole wheels, cast on stitch, bullion knots, French knots, a whipped spoke stitch, and whipped wheel. Designing on the fly is certainly a fun way to stitch. I hope you have enjoyed reading this Daily Stitch Challenge Part 2. Sharon Leahy when I have it on a hoop I take it off over night then when it gets too much for a hoop I stretcher on bars and it stays on those till done. I love seeing your progress on this piece! There is a wealth of enjoyment in your eye candy. 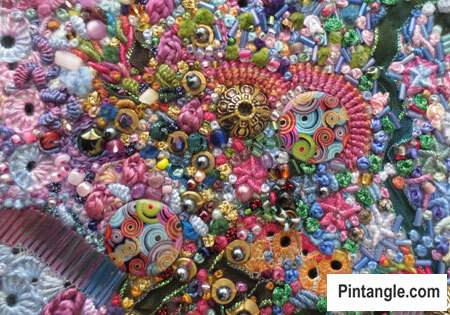 It is amazing how closely the stitches sit and yet each is seen perfectly – mine would surely be snagged. Thanks for sharing your beautiful work and the thread/stitches information. 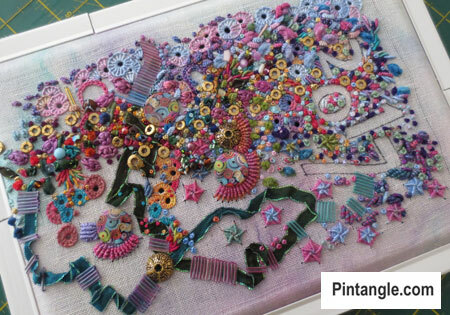 It’s a pleasure to see this pretty embroidery, thanks for sharing so many details. My fingers are itching to start stitching! Thankyou for sharing your piece ..It’s great..I’ve never tried negative space in this way ..Feel inspired.will your book be on Amazon UK ? Vickyvicx Thanks for your compliment – I am assuming the book will be on Amazon UK. Distribution is up to the publishers – this book is not self published but published by C&T publishing a large American company that specialises in Quilting and sewing books. Since they are available in Australia I am sure they will not miss the UK market. This is so lovely, Sharon. I could look at it all day! Wonderful piece & wonderful explanation. I always love it when people include thread details and stitches and you have also given us a peek into your design process. I also like the use of negative space!! Plus congrats on the book!! This is very beautiful. I appreciate the talent, skill, and artistry that went into the making of it. Thank you for sharing your knowledge and love of embroidery with others. This is so beautiful, and I appreciate the talent and artistry that went into the making of it! You are so kind to share your knowledge and experience with us. Thanks Sharon. You are always an inspiration. As I stitch on the fly often I must try your design points. See you Monday. Double Congrats to you! On your book – which I’m going to order- and congrats on this piece. I love it! I’m a relative recent beginner, so I have to say that you inspire me to reach for the stars and you shine bright among them! Right now, however, I’m still working on kiko’s flower . . . a million and one, a million and two . . . Again,congrats!!!! Thanks Sharon, I’m learning from you on free form embroidery. I’ve never done it before, and am having so much fun I a yearinstitches. And I’m using the stitches you’ve taught us. Just got my first of your daily gabs. My gosh! 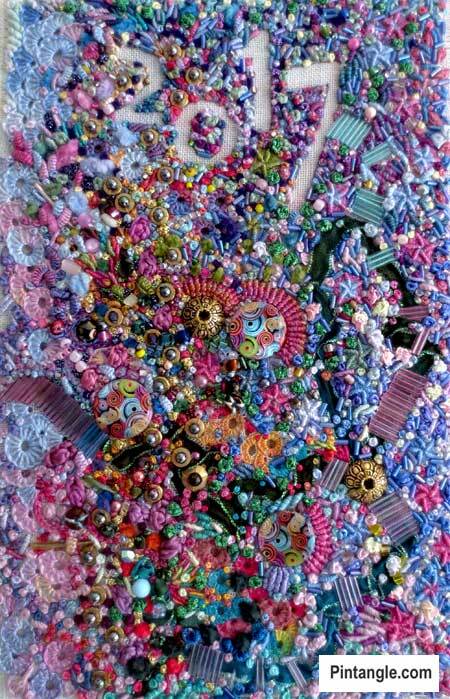 What a gorgeous assemblage of stitches. Used to do a lot of CQ…met you in that class in Hartford CT a few years ago. MUST get back to it. My real thing now is small scale miniature petitpoint but I do miss the great freedom and creativity of your style. Have ordered your new book Can’t wait.